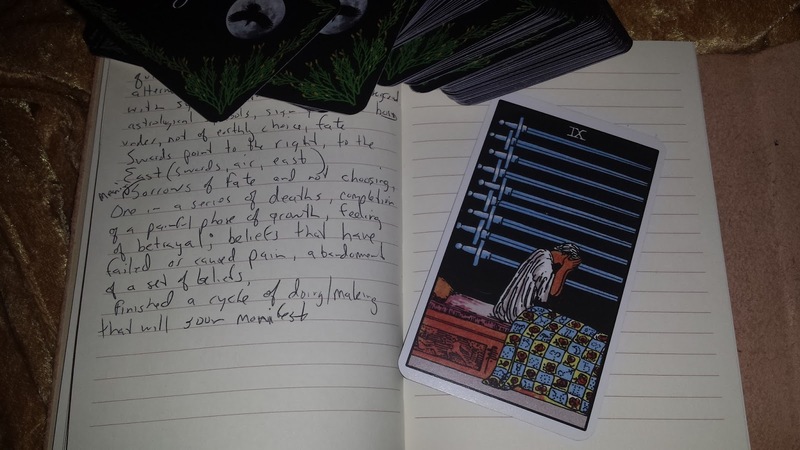 Analysis of the Nine of Swords. Completion of a cycle, earthly fulfillment, in contrast to 10: mastery, transcendental fulfillment. Traditional: Thoughts, speech, communication, ideas, beliefs, principles, truth, mental abilities. The element of air and the direction of east. Esoteric: In the flow of suits, we progress from the idea/birth/conception/source (wands), to the pattern/abstraction/design (cups), to the process/doing/making (swords), and finally to the actualized manifestation/delivery/possession (pentacles). Nine swords, horizontal, stacked vertically, pointing to the right, the east. The hilts are interlaced, look woven together, like the first couple passes of a carpet on a loom. A person is waking up distraught, from nightmares, worry, sorrow. The night gown indicates the intent was sleeping, but it did not happen. Bed frame engravings show one man having attacked and knocked down or slain another man, each beside a tree. The blanket is a quilt with red flowers on yellow, alternated in a checkerboard pattern with astrological symbols with light blue background. Astrological symbols on the blanket reflect being born under a certain time, not of earthly choosing but of "fate". Sorrow of fate, an unchosen painful path. One in a series of deaths, not likely physical but symbolic. Completion of a painful phase of growth. Feeling betrayed. Beliefs that have failed or caused pain, resulting in another cycle of shedding beliefs, "dying beliefs". This pain is not destructive to the soul but is an opportunity for growth. Alternately, finishing a cycle of doing, making, processing that will soon bring about some manifestation, realization.